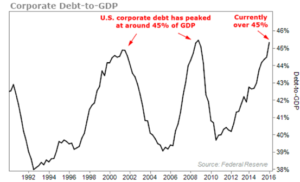 Corporate debt in the U.S. has soared over the last few years. A great chuck of this debt originates from subprime lenders, auto makers, and mall developers and operators. 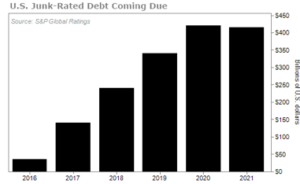 In 2017, the first maturities on the colossal amount of junk bonds that were issued in the record issuance cycle between 2010 and 2015 are a dark, overhanging cloud. $125 billion will be due. The default rate across the sector will approach 10%, with the real issue being the lack of refinancing abilities for companies. This is just the start. In 2018, we’re looking at $250 billion due. Then in 2019, it’s $350 billion, to be followed by two years of $400 billion in junk that matures in 2020 and 2021. Junk bonds are only part of a bigger challenge. 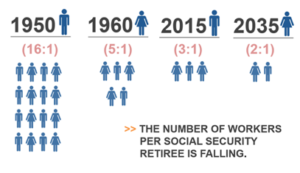 The amount of retirees in the Western World is truly astounding – we call it the Age Wave. This demographic problem is what personally makes me most alert. It’s demographics that drive welfare costs higher, and it’s demographics that have an immense impact and direct correlation to asset prices. 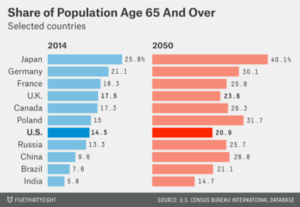 Older demographics are a scenario that our paper monetary system hasn’t had to deal with thus far. The roadmap is clear, though: retiring individuals depend on working-class people in western societies, but the economy is shrinking, since the worker-to-retiree ratio is decreasing. 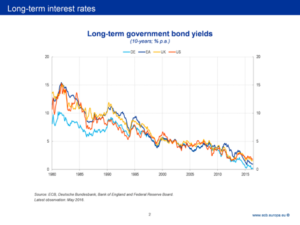 Ultra-low interest rates, coupled with low tax receipts, make it impossible for retirees to earn safe yields and for governments to provide a social-economic safety net on the flipside. What could be detrimental to us as a society is that retirees begin liquidating assets to fund their long-awaited retirements, but younger generations won’t have the purchasing power to facilitate this surge in supply. Prices could fall sharply, and my greatest worry is that the government would feel like it must intervene and begin purchasing more and more real estate holdings, stocks, and bonds to ensure the economy doesn’t contract. This is so alarming because it won’t be the Federal Government doing the buying directly – they will either use legislation to allow the FED to be the buyer, or some form of universal handout to citizens might be made – helicopter money, but to the people, instead of banks. This sounds like an impossibility, but so did zero interest rates, bailout programs, and a 100% paper monetary system with no tangible reserve backing it. I truly believe that each one of us will have to navigate our own boat from now on, because the economy will undergo massive changes that will challenge the wellbeing of many. Whether you’re just starting out, in your peak earning years, or approaching retirement, I want you to have the best tools to live life to the fullest. That’s what Fortressing means — building a financial fortress of assets and multiple income streams — and Wealth Research Group plans to unleash many more creative ideas to help you flourish. Becoming a slave of problems is not the winning strategy – preparing and keeping poised is.